Sherry FitzGerald welcomes No 123 Sli Gheal to the market for sale by private treaty. 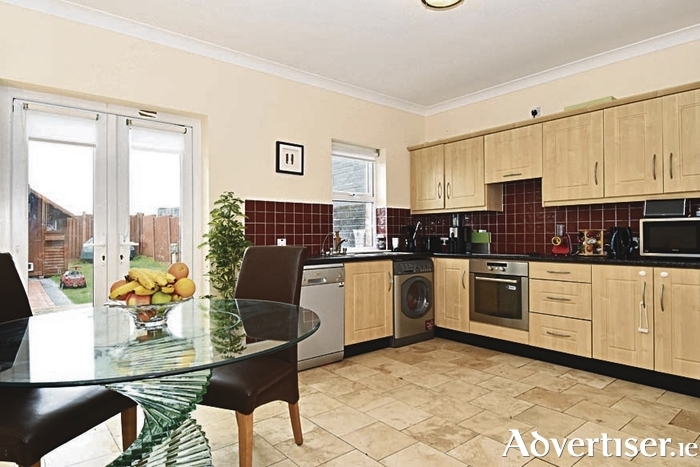 This is a quality, well fitted and maintained family home with west facing rear garden. Located in Sli Gheal, which is just off the Upper Ballymoneen Road, the area is popular and well serviced with all amenities close by including schools, church, recreational and sporting facilities, and both the Knocknacarra and Gateway shopping centres. No 123 is an owner occupied end of terrace home which was built in 2003 and is ready for immediate occupation, with good quality fittings throughout. The house is bright and spacious with large, well-proportioned, rooms over three floors. The BER is C1 on BER cert no 109060244, with an energy performance indicator of 158.45kWh/sq m/yr. Asking price is €240,000. The house has a bright entrance hall, with living room to the right and kitchen/dining to the back. A guest toilet under the stairs completes the accommodation on the ground floor. The first floor features two double bedrooms, one en suite, and the main bathroom. The second floor comprises two further double bedrooms, one of which is en suite. All in all this is a good quality ready to occupy home with spacious, bright, accommodation in a well serviced sought after location. Viewing is recommended to appreciate what this home has to offer.